Think labor is hard? Try giving birth while taking an exam. It sounds impossible, but one woman proved herself to be the ultimate multitasker by doing just that. 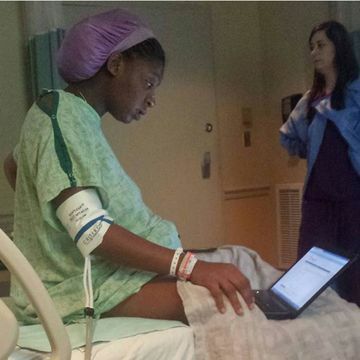 If your jaw drops when you see this photo of a woman taking an exam while in active labor, you're not alone. The image, shared by Shanell Brinkley-Chapman, has gone viral for good reason—frankly, we're impressed when a woman can muster up the energy to smile during labor, but even that pales in comparison to what Brinkley-Chapman's sister, Tommitrise Collins, managed to accomplish while giving birth. As anyone who has seen the viral photo knows, Collins managed to take a psychology exam while she was in the active stage of labor. Which is, in a word, unreal. The photo showed Collins wearing a hospital gown while sitting up in bed and working on her laptop. Despite the fact that she was hooked up to monitors, she seemed far more relaxed than most people look while taking a test and definitely more composed than the majority of women are while in labor—which is remarkable, because Collins was doing both at once. As Collins's sister pointed out, the whole image is an incredible display of what "strong priorities" look like. According to Brinkley-Chapman's original Facebook post, the photo was taken while Collins was experiencing contractions just three minutes apart. The photo quickly spread like wildfire—according to Brinkley-Chapman's Facebook page, it's already been shared over 14,000 times. Consider it inspiration for to-be mothers everywhere. Brinkley-Chapman also posted a message announcing the arrival of her beautiful niece, Tyler Elise. Brinkley-Chapman says her strong, determined sister will make an amazing mother—and we couldn't agree more.